Project Bootstrap is a Low-Wealth Residential Building that grows on High Density Residential zones . When the Colossus Addon Mod is installed, all of the default lots are have their stages set to Stage 10 and the Resident Capacity is reduced to 6260. It is otherwise unchanged. Project Bootstrap is argued to be the worst recreation in SimCity 4 and one of the worst models in general. It is assumed that it is mostly based on Chicago's former Lexington Hotel, demolished in 1996 and used as a headquarters for some time by gangster Al Capone. The recreation is missing many details the real building had, most obviously the Bay Windows on both street frontages. It is overall a poorly-made model, the reflection map was obviously one designed to be used for a shopfront and the building's base is lazily made, wholly uninteresting and completely unlike the real building. 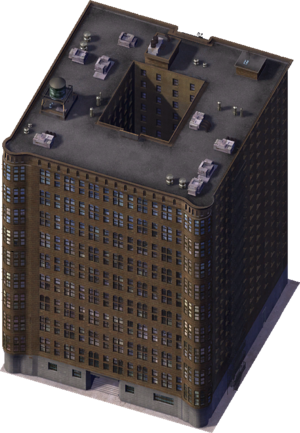 Cementing the idea that it a recreation of the Lexington Hotel is the existence of a short wall on roof beside the building core, which is clearly a mistaken Storeroom or Roof Access which was present in the same place on the real building. This page was last modified on 28 June 2014, at 13:36.